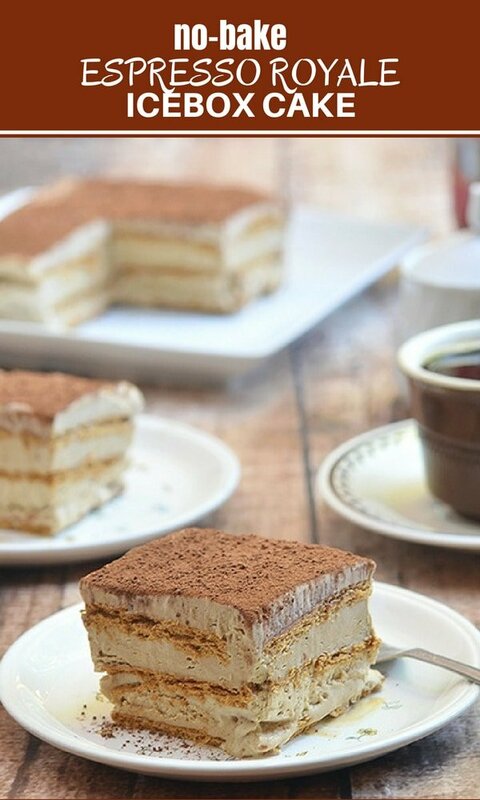 Espresso Royale Icebox Cake with delicious layers of graham crackers and espresso mousse. 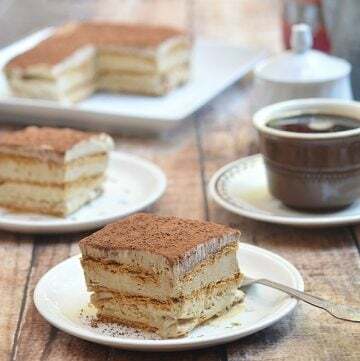 Rich, silky and with an intense coffee flavor, this icebox cake is so easy to make and is sure to become a favorite summer treat! 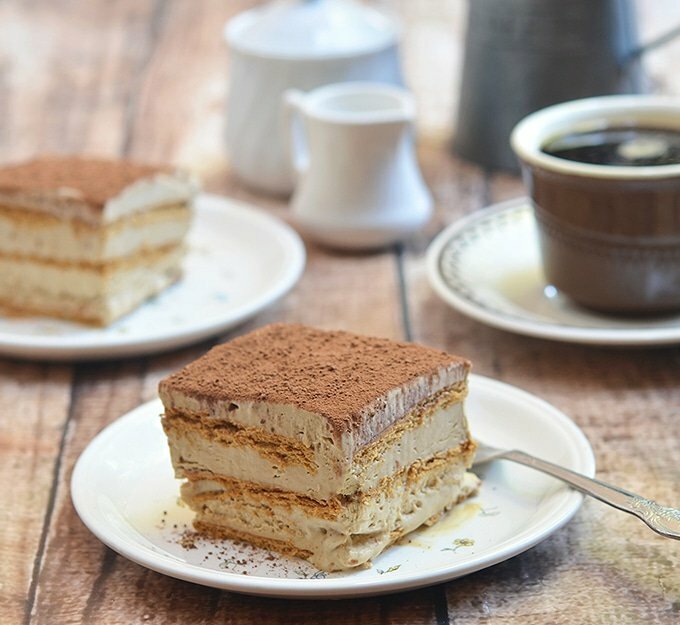 Espresso Royale was inspired by Mango Float, a type of icebox cake with graham crackers, whipped cream, and sweet mango pulp that’s popular in the Philippines. I was in the mood for the cake one day but couldn’t for the life of me find Manila mangoes at any of the stores I drove to. Failing to find the needed fruit and with images of the luscious dessert dancing in my head, I decided to give the icebox cake idea a different spin to quiet the cravings. Instead of diced mango for flavor, I added a heaping tablespoon of instant coffee to the whipped cream for a delicious punch of flavor. Boy, was the mocha mousse to die for! The delightful hint of coffee went so well with the buttery graham layers, I was actually glad I didn’t find mangoes. 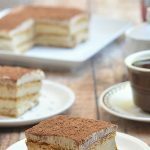 If you are looking for a special dessert that’s easy to make, this Espresso refrigerator cake is it! All it takes is about 10 minutes of hands-on time and less than five simple ingredients to come together into one scrumptious treat. There’s no baking involved which is perfect for hot Summer months when the last thing you want is to have the oven on. Can You Freeze an Icebox Cake? Yes, you can! 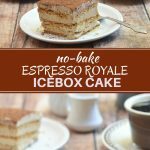 This Espresso Royale icebox cake needs to be refrigerated overnight to set and popped in the freezer for about 1 hour to sturdy a little. If you prefer more of an ice cream cake consistency, freeze it for at least 6 hours or overnight. Either way, it’s worth the wait! Use a heavy cream with at least 30% milkfat content for sturdy foam and better peaks. To whip up to maximum volume, the heavy cream and condensed milk need to very cold. Also, chill the bowl and the beaters in the freezer for about 20 to 30 minutes. Beat the cream at low speed first to build smaller bubbles for a stable foam. When it begins to thicken, increase the speed to medium and continue to beat until you reach stiff peaks. Do not overbeat the whipped cream or the fat in the mixture will separate! Beat the cream to stiff peaks. It should be thick, heavy and clings to the beaters. To check, turn the whisk up. The peaks should point straight up without collapsing. I garnished the top with a generous dusting of cocoa powder but feel free to substitute chocolate shavings, if you like. Want more easy no-bake treats? Try this three-ingredient Oreo Ice cream cake! Line a 9 x 6 x 2 baking pan with parchment paper, leaving about 1-inch overhang on all sides. In a bowl, combine heavy cream, condensed milk, and liquid coffee. Using a hand mixer at low speed, whip mixture until it begins to thicken. Increase speed to medium and continue to beat to stiff peaks. Arrange one layer of graham crackers on bottom of the prepared baking dish, breaking pieces as needed to fit sides. Spoon ⅓ of cream mixture on crackers and spread to cover. Arrange another layer of graham crackers over the cream. Spoon and spread ⅓ of the cream mixture. Repeat with another layer of graham crackers. Spoon and spread remaining ⅓ of the cream mixture on top of crackers. Cover tightly with plastic film and refrigerate overnight. Freeze for about 1 hour before serving. Or freeze for about 6 hours for ice cream like consistency. Lift cake from pan using parchment paper overhang as support and transfer onto a serving platter. Sprinkle cocoa powder or chocolate shavings on top of cake or dust with cocoa powder. Cut into squares to serve. To make chocolate shavings, run a vegetable peeler across sides of a bittersweet chocolate bar. Use a flour sifter to easily dust top of cake with cocoa powder. 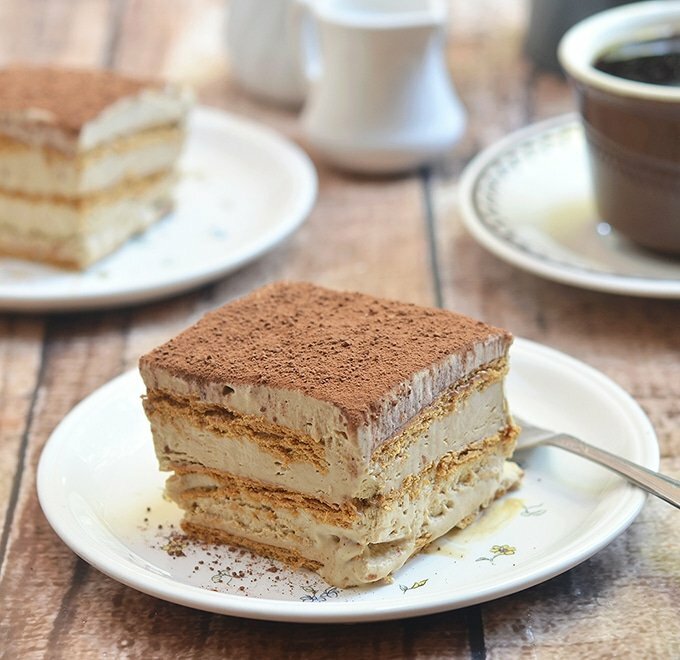 Coffee in desserts is always a win in my book! This looks like a great dessert for these hot summer days! It is a perfect drink to chill around with these days ?. 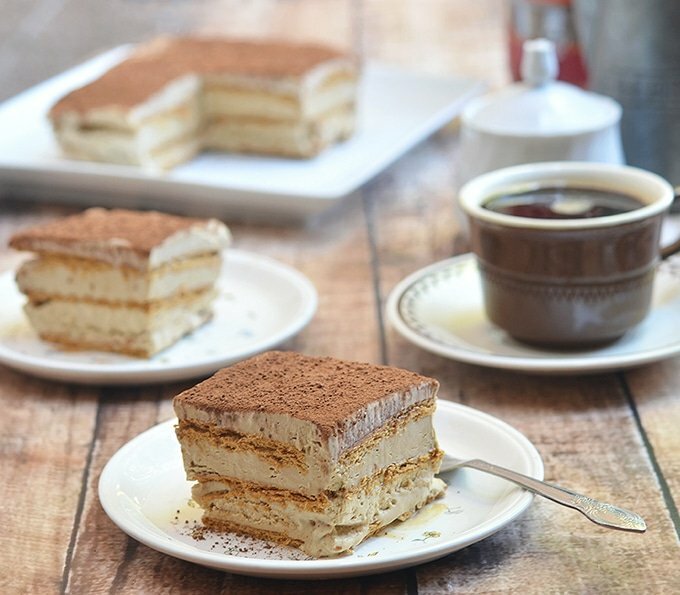 Love desserts that use coffee – This is right up my alley! It will satisfy your coffee cravings, Christine! Why is this called espresso cake!? I tried this… It’s so delicious, am trying out your other desserts which are vegetarian… Ie egg free! Would I be able to use any other egg replacement in place for the egg baking recipes? Can’t get Graham crackers in the Netherlands unfortunately, but this recipe looks super-easy! I’ve never tried it with anything else but vanilla wafers might work. I’ll give them a try this weekend and will update you. Thanks. I was given a tin of Royal Dansk Danish Butter Cookies as a tip, and knew I could use them for something interesting. This sounds like a delicious possibility. Victoria could find those maybe. Great idea! Butter cookies sound like a good substitute. Please let me know how they turn out! it was so good considering how simple it is to make. What exactly is Nestle table cream? Is it the same as whipping/heavy cream? I’ve seen evaporated milk and condensed milk in cans, but never table cream. I haven’t personally tried heavy cream with refrigerator cakes but I see no reason why we can’t. Enjoy!